Building Our Verona: Update and Some Good News (for a change)! Update and Some Good News (for a change)! A quick update on the water damage: All drywall was repaired and various baseboards were replaced. It took two visits as they missed some areas the first time. For those that are considering painted before your 10 month, I don't recommend it at all! The areas that I had already painted (after my 10 month) only had the drywall repaired. They didn't even bother to paint with the original wall color so that I at least had one coat of paint on it before adding our custom color. The patched areas still do not blend with the original drywall. I have put three coats of paint on. It's getting better, and I am thankful that it is in the stairwell where it is hidden by shadows, but it is aggravating to have to go through painting the stairwell again. Onto the good news! The laminate flooring in our foyer, hallway and powder room has been an issue since we moved in. The flooring installers have been here about four times (I've lost count) trying to fix issues with loose subfloor along with creaking and squeaking in the flooring. Supposedly, it is binding up under the baseboard. They kept trying but were unable to eliminate the noises. Because of the volume of water that got onto the floor, it was determined that they would need to replace most of the laminate and because of the noise issues, they agreed to replace it all. Since they were replacing all of it, I asked to select a different flooring. They agreed! I have never liked our laminate. It has such a high shine finish that every little spot shows. Sweaty footprints always mark up the floor, and unless it's been freshly cleaned, it looks awful. We went to the showroom to select new flooring, and the flooring rep was great. Since we were selecting floor "after the fact," we were allowed to pick from the entire showroom, not just the Ryan room. 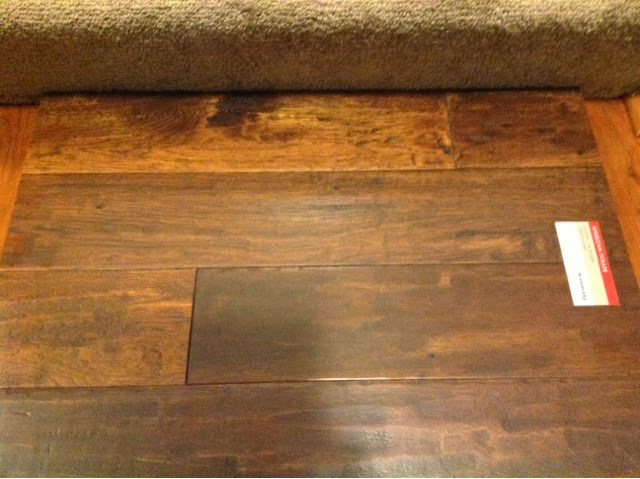 We were able to bring home a few samples, and we are excited to be getting handscraped hickory solid wood flooring! That looks like our floor! Rural Living Fall Canyon? Erin, it's Armstrong American Handscrapes Hickory Candy Apple. 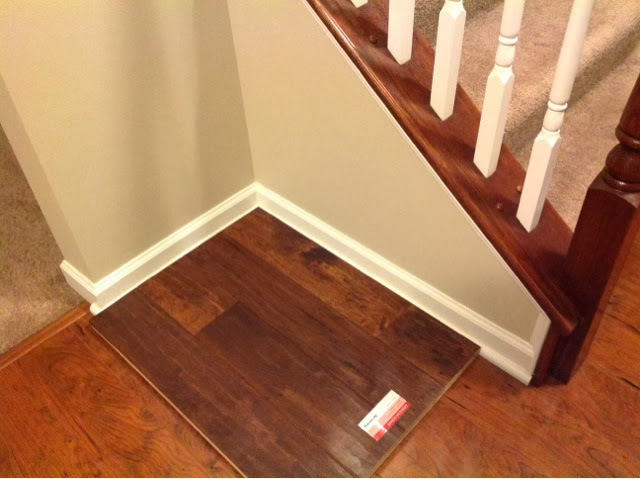 You are so lucky you got your pick of flooring! I love your choice! I can't wait to see it installed. Wow, what a perk Rachel!! Its almost worth it isnt it!! 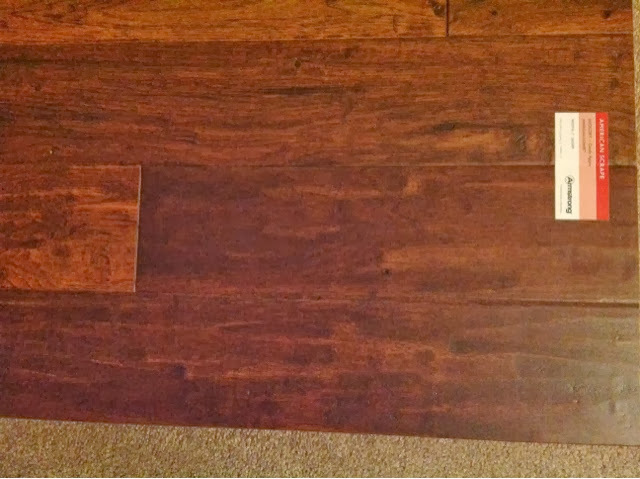 From laminate to hardwood floors, I'll take it! !